Upper: DUKE OF YORK, July 1942. 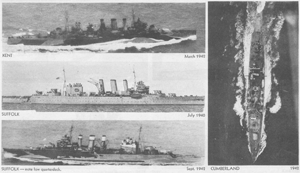 Lower left: DUKE OF YORK, July 1942. 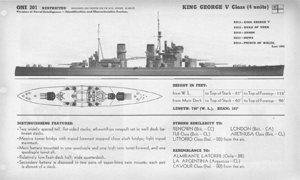 Lower middle: KING GEORGE V, 1941. 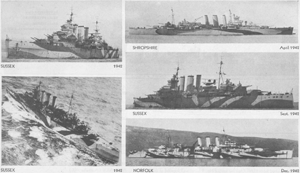 Lower right: DUKE OF YORK, 1942. 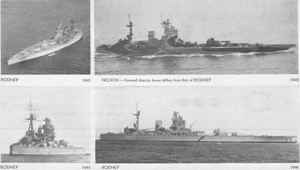 Lower left: RODNEY, 1941. Lower right: RODNEY, 1941. Upper left: VALIANT, April 1940. 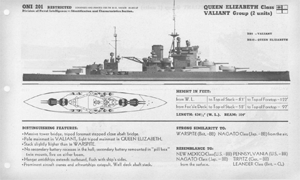 Upper right: VALIANT - note pole mainmast and absence of sternwalk, 1939. 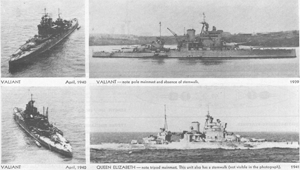 Lower left: VALIANT, April 1940. 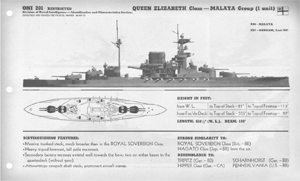 Lower right: QUEEN ELIZABETH - note tripod mainmast. This unit also has a sternwalk (not visible in the photograph), 1941. 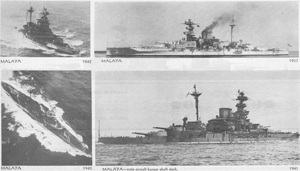 Lower left: MALAYA, 1942. Lower right: MALAYA - note aircraft hangar abaft stack, 1941. 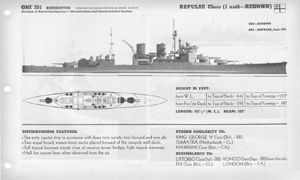 Upper: RESOLUTION, September 11, 1941. The only unit with a catapult on top of No. 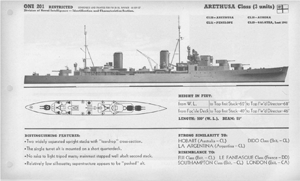 3 turret. Lower: REVENGE, 1941. The only unit with after edge of upper bridge extended towards the stack. Upper Left: RENOWN, 1942. 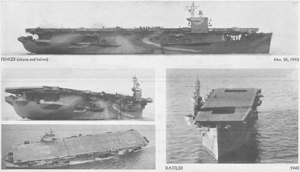 Middle left: RENOWN - note aircraft hangars abaft second stack (1942). 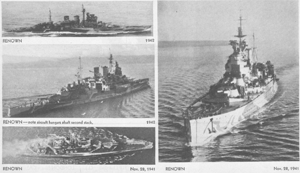 Lower left: RENOWN, Nov. 28, 1941. 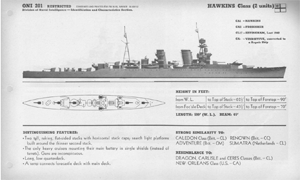 Right: RENOWN, Nov. 28, 1941. Upper: FURIOUS, Nov. 7, 1940. Lower left: FURIOUS, July 10, 1942. Lower right: FURIOUS, 1942. Upper left: VICTORIOUS, Feb. 19, 1943. 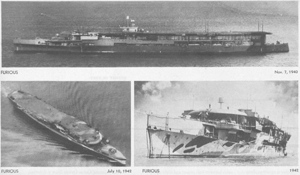 Upper right: ILLUSTRIOUS, 1940. 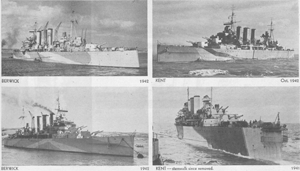 Middle left: INDOMITABLE, 1942. 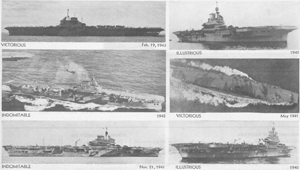 Middle right: VICTORIOUS, May 1941. 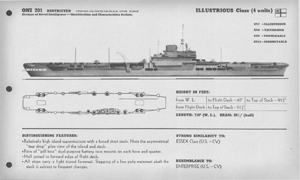 Lower left: INDOMITABLE, Nov. 21, 1941. 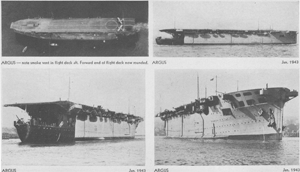 Lower right: ILLUSTRIOUS, 1940. 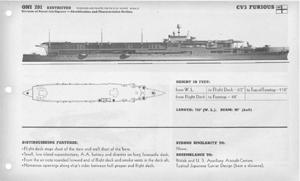 Upper, middle left, lower left: FENCER, March 26, 1943.
open structure below flight deck extends further aft than in rest of class. Dec. 21, 1941. 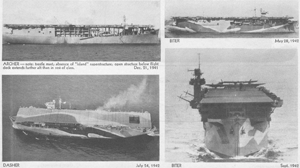 Lower left: DASHER, July 24, 1942. Upper right: BITER, May 28, 1942. Lower right: BITER, Sept. 1942. 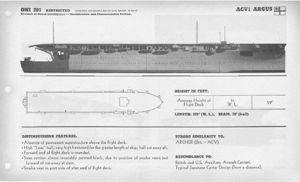 Upper left: ARGUS - note smoke vent in flight deck aft. Forward end of flight deck now rounded. Lower left: ARGUS, Jan. 1943. Upper right: ARGUS, Jan. 1943. Lower right: ARGUS, Jan. 1943. 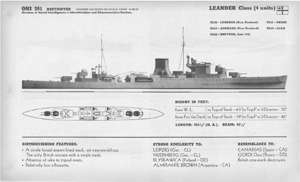 Left: CUMBERLAND - note cut-away quarterdeck, 1936. Upper right: BERWICK, 1942. 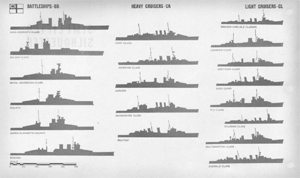 Middle right: BERWICK - hanger and catapult amidships have been removed, 1942. 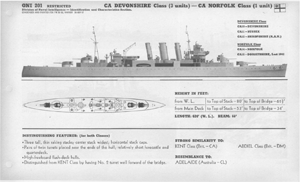 Lower right: AUSTRALIA - the only unit with pole masts and her heavy A.A. battery mounted on the main deck instead of on the shelter deck, Aug. 1942. Upper left: KENT, March 1942. Middle left: SUFFOLK, July 1940. 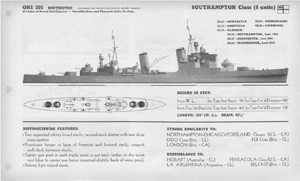 Lower left: SUFFOLK note low quarterdeck; Sept. 1942. Right: CUMBERLAND, 1942. Upper left: BERWICK, 1942. Upper right: KENT, Oct. 1942. Lower left: BERWICK, 1942. 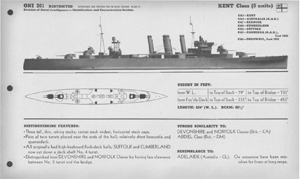 Lower right: KENT - sternwalk since removed, 1941. Upper left and lower left: SUSSEX, 1942. Upper right: SHROPSHIRE, April 1942. 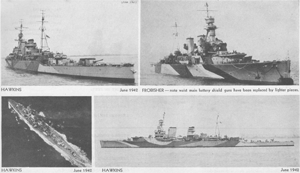 Upper left: HAWKINS, June 1942. 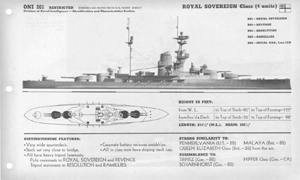 Upper right: FROBISHER - note waist main batter shield guns have been replaced by lighter pieces. Lower left: HAWKINS, June 1942. Lower right: HAWKINS, June 1942. CL 9 - DRAGON, under Polish operation. 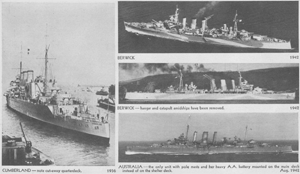 Upper left: DESPATCH, July 1942. Upper right: DIOMEDE - note gun-house to No. 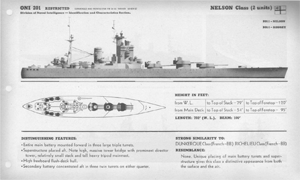 1 6-inch gun; only ship so fitted. Middle left: DELHI - differs from rest of class. 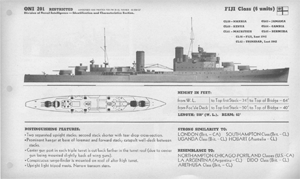 Note American design gun-houses, new bridge and director towers, shifting of search lights and new masts. 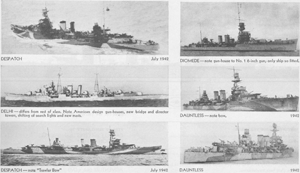 Middle right: DAUNTLESS - note bow, 1942. 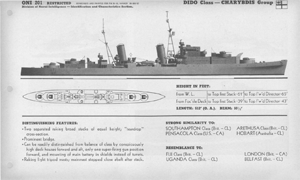 Lower left: DESPATCH - note "Trawler Bow", July 1942. 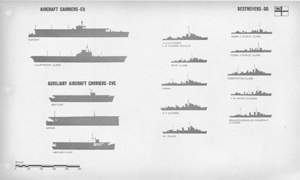 Lower right: DAUNTLESS, 1942. Upper left: ORION, 1942. 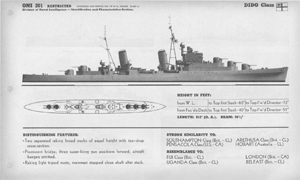 Upper right: ACHILLES - tripod masts not fitted, 1941. Middle left: AJAX, Nov. 1942. 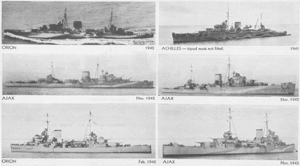 Middle right: AJAX, Nov. 1942. Lower left: ORION, Feb. 1942. 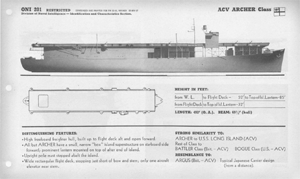 Lower right: AJAX, Nov. 1942. 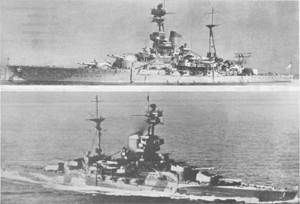 Left: PENELOPE, Sept. 1942. 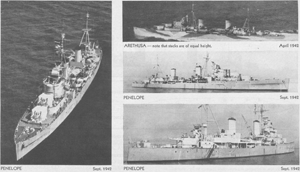 Upper right: ARETHUSA - note that stacks are of equal height, April 1942. Middle right: PENELOPE, Sept, 1942. Lower right: PENELOPE, Sept. 1942. Upper left: SHEFFIELD, Sept. 1942. 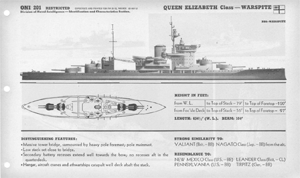 Upper right: BIRMINGHAM - has continuous flare to bows, Sept. 1940. Middle left: LIVERPOOL, Oct. 1941. 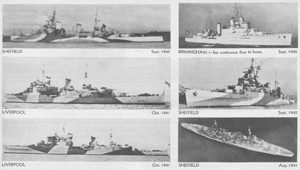 Middle right: SHEFFIELD, Sept. 1942. Lower left: LIVERPOOL, Oct. 1941. Lower right: SHEFFIELD, Aug. 1941. 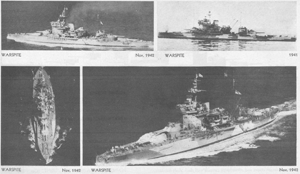 Upper right: PHOEBE - note that two turrets forward have been removed, Jan. 1943. 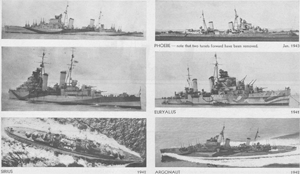 Middle right: EURYALUS, 1941. Lower left: SIRIUS, 1942. 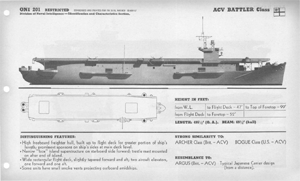 Lower right: ARGONAUT, 1942. 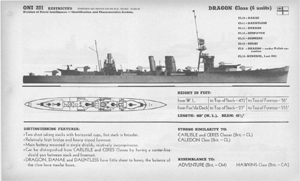 Lower left: CHARYBDIS, Feb. 1943. 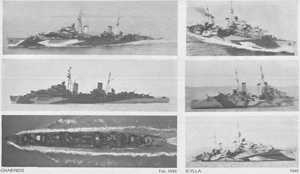 Lower right: SCYLLA, 1942. Upper left: MAURITIUS, 1942. Upper right: MAURITIUS, 1942. Middle left: BERMUDA, 1942. 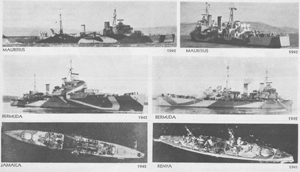 Middle right: BERMUDA, 1942. Lower left: JAMAICA, 1942. Lower right: KENYA, 1941.